Here she is in all her loveliness– Queen Anne’s Lace, named after Queen Anne of England, who was an expert lacemaker! This umbrella-shaped flower is made up of many tiny white flowers; together they form the “lacy” pattern characteristic of the wildflower’s inflorescence. Below the umbel of flowers is a spray of finely divided green bracts. The leaves of the plant are finely divided too—they might remind you of parsley or dill. This is a non-native biennial (from Europe) that grows to about 3 ft. in height during its second year. It can be found blooming in dry fields and along roadsides June through August. As the white flowers fade and the head begins to dry, the umbel curls up into a concave bird’s nest shape. (See the gallery below.) This structure can break free and blow away, just like a tumbleweed. Other common names for this plant include birds nest (because of the shape of the dried umbel) and wild carrot (because the root is a carrot-like taproot). 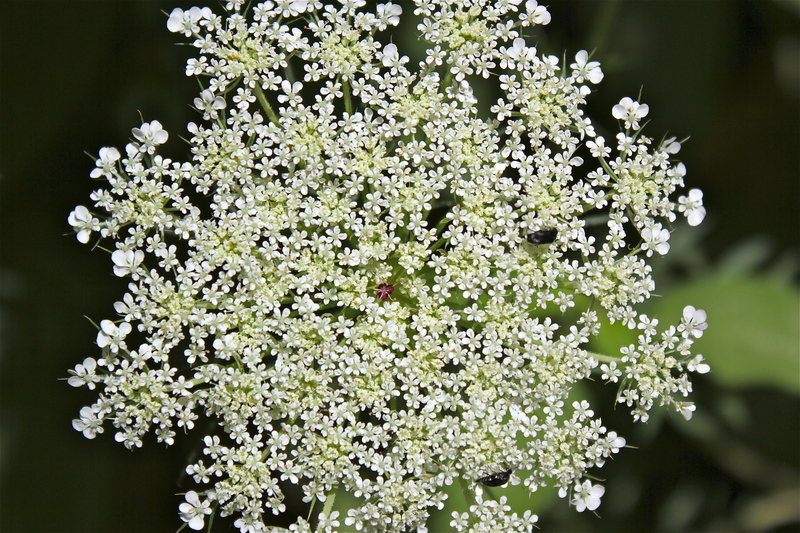 Queen Anne’s Lace has been used medicinally for a variety of a ailments, but the most notable use was as a form of birth control. Chemicals in the seed can act as an abortfacient. Wondering about the darker dot in the center of every flower? The spot is just a small dark floret, or flower. However, one old story suggests that it symbolizes a drop of blood that was accidentally shed by Queen Anne while she was making a lace doily. The bird’s nest is developing!